This week's store post comes from a very helpful man on Yelp from Port Murray. He took some excellent videos of the final days of the A&P in Washington, New Jersey. Now, I'm pretty familiar with this area, but I never knew that there were two 'Washington's in New Jersey... in the same area. I always associated Washington as Washington Township, which is near Phillipsburg. It turns out that the Washington that I know is actually just Washington, and not Washington Township, which is located further out in New Jersey, but yet a few towns over. Oh, and to make this more confusing, the 'Washington' IS actually an incorporated township... and the A&P is listed on Google Maps being in Hampton, New Jersey... I'm spinning in circles just thinking about it again. On that note, lets get started. Greg gives us a very interesting look at the beautiful Fresh 3.0 decor, with unchanged flooring from the standard 90's Foodmarket decor. Something interesting that I noticed about this store is that they don't have the European aisles! The one thing that Acme Style and many other retail bloggers always hated, is nowhere to be seen in this store. I've passed this store every year or so on the way out to Jefferson Township for a weekend on the many lakes, which is coincidentally, also a town of many A&Ps. 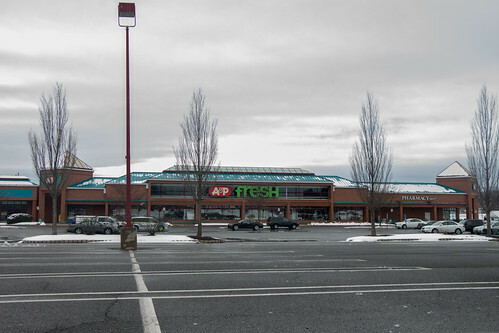 I never went inside of it, probably since it was one of the most successful A&P stores in Warren County. I will take pictures the next time I go out there... it's now abandoned.